Everything you wanted to know about crypto-currencies and were afraid to ask! We are excited to welcome Prof Ross Anderson to speak to the Society at le Cercle des Voyageurs, Rue des Grands Carmes 18, 1000 Bruxelles. The restaurant is on a small side street quite close to the Grand Place. (Please note that members of the Cambridge Society of Belgium, their guests, our sister alumni societies and those invited will have priority. Those dining will have priority over simple attendees. Interested persons are also very welcome if space permits. All should register as soon as possible in order not to be disappointed, see below.) Looking forward to seeing you there. Ross Anderson is Professor of Security Engineering at Cambridge University. He was one of the founders of the discipline of security economics, and leads the Cambridge Cybercrime Centre, which collects and analyses data about online wickedness. He was one of the designers of the international standards for prepayment electricity metering and powerline communications; he was also a pioneer of peer-to-peer systems and hardware tamper-resistance. 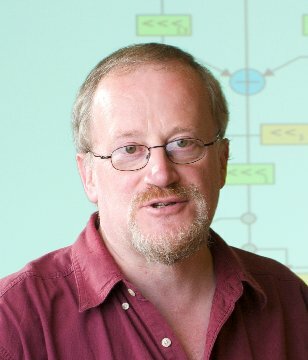 He is a Fellow of the Royal Society, the Royal Academy of Engineering, and the Institute of Physics, and a winner of the Lovelace Medal – the UK's top award in computing. Ross will talk about tracing stolen bitcoin. Cryptocurrencies hold out the prospect of financial innovation, but are simultaneously an investment bubble, an environmental disaster and a vehicle for cybercrime. How might they be tamed? As passing new laws can be hard, we'd better use existing ones, and developing more efficient ways to track stolen cryptocoins might be a good place to start. Prepare your questions. This should be a wonderful insight into the world or crypto currency. 6pm onwards (or before) members will be welcome and may purchase refreshments. 6:30pm onwards, Ross will give his presentation. We look forward to your questions. 7:15pm to 7:30pm we will commence dinner. Those not able to attend the dinner may leave. Please confirm your attendance ASAP before Wednesday 11th April. Preferably by email to secretary(at)camsoc.be mentioning who, how many, membership status, amount payable (or paid) and for what. Also please give the choice of menu as soon as possible and in any case before Thursday, 12th April noon (absolute limit). Member price (including spouse) = free! Make your payment to the Cambridge Society bank account (BE26 0689 0251 7329 in the name of "Cambridge Society of Belgium”) mentioning "Prof Anderson Talk" giving your last and first name if any possible ambiguity. Your participation is fully confirmed once your payment has been received. The possibility of attendance subsidised by society funds exists if anyone should be in a position of genuine need (please contact our Hon. Secretary, Matija or our Hon. President, Steve). In order to simplify organisation we have opted for a fixed menu with a choice and vegetarian option. Wine and water is included. Please provide your choice per person when making the registration by email. The absolute date limit for choice is Thursday 12th April at 12 noon though please do inform us of your choice as early as possible.